Inkjet is taking the graphic arts world by storm. The range of applications is virtually endless allowing you to print anything from stickers up to building wraps. 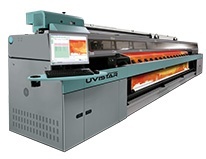 Flatbed UV inkjet printers can create a bewildering variety of advertising and point-of-sale material and are being used increasingly for short-run packaging jobs. The beauty of inkjet is that it can fit in with existing workflows and increase the level of service offerings to your existing customers – and win over new ones.